When it's time to sell a franchise or enlist more franchisees, it's important to get your franchise in front of as many potential buyers as possible. businesses online, and attracts more than 55,000 visitors a month. We are NOT Business Brokers, we are online advertising specialists operating New Zealand's leading Business for Sale website. LIST your franchise for sale and it will appear on BOTH the www.nzfranchises.co.nz and the www.nzbizbuysell.co.nz websites. Choosing a 6 month or 12 month listing gives you a 10% to 15% discount. 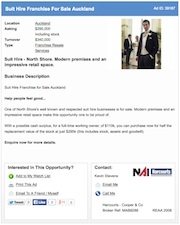 + Reach 1000’s of Buyers - we target NZ franchise and business buyers. + Ongoing Exposure - your ad is up there 24/7 for 6 whole months, plus posted to our buyer database. + Greater Reach - exposure locally, nationally and internationally. + Response Guarantee - if you don’t get at least one enquiry, then the next 2 months are on us. + Better Results - over 14 years specialising in NZ Businesses for Sale, it’s what we do. See what others have to say in their testimonals. Or click here to print an ad form, then post or fax us your information and we'll put your franchise for sale online for you! Contact us now to find out more. Our dedicated team of specialists will help you get the best from your online franchise and business for sale listings - It's what we do. We look forward to being of service when you list to sell a franchise. Have a question? then please contact us. "Thank you so much for your effective advertising. Our business has sold conditionally. At this stage everything looks positive so please remove our Pizza Haven advertisement. Our business has sold. We thank you for providing us with an excellent service. Our advertisement with you was more successful than the NZ Herald. nzbizbuysell has been recommended to many."